It’s hard to resist the promise some baby shampoos offer of “no more tears.” I mean who wants their happy, splashing sweetheart to transform into a thrashing, screeching child when it comes time to wash their hair? DMDM Hydantoin: A chemical known to be toxic to the immune system, with strong evidence of being a skin toxicant as well. Sodium Lauryl Sulfate (SLS): This harsh, degreasing detergent commonly found in shampoos, soaps, and even toothpaste, is a skin and eye irritant. Fragrance: Personal care products can be found in kid-enticing fragrances such as bubble gum and razzleberry. These synthetic fragrances are petrochemical loaded concoctions, which can wreak havoc with repeated exposure. (For great info on fragrance check out this Care2 article. Ceteareth and PEG compounds: Petrochemicals that may contain cancer-causing impurities. Organic Blessings Little Angel Shampoo/Body Wash or Miessence’s Desert Flower Shampoo. A secondary tip: A third of the tears and screams come from water in the eyes, with or without irritating shampoo. Add fun to hair washing by letting your kids wear goggles. Since employing this idea, my kids now semi-look-forward to having their hair washed. Terri Hall-Jackson lives in the Hudson Valley with her husband and two young children. In addition to writing, Terri works with public television and radio stations/networks in the area of new media, and leads workshops on authentic and empowered living. P.S. Those no more tears formulas often have numbing ingredients in them, to prevent babies from feeling the damage being done by the surfactants in their shampoos. So, not only are they damaging their eyes, you won't even know it because it prevents the kids from feeling it. Personally, I'd rather just be super careful shampooing my child's hair (and handling any shampoo in the eyes freakouts if something DOES get in there), than not know when a toxic chemical is damaging my babie's eyes because they're using numbing chemicals. It's sick what greed produces, no? This is the second time I've seen people asking about using essential oils, and the last one was suggesting using some to brush their teeth. It is is very very important to NEVER use essential oils, especially on children (and NEVER on cats) if you don't know much about them. Essential oils easily penetrate the skin and are super concentrated. While wonderful to use in diluted forms, and essential to body care, whether natural or conventional, they should never be used by inexperienced persons. Never use essential oils on children other than mandarin, lavender, and balsam of peru (and then only in a diluted form). Up to three or four drops per eight ounces is usually enough. Please just do your research before using essential oils. They can be your best friend if you use them right. 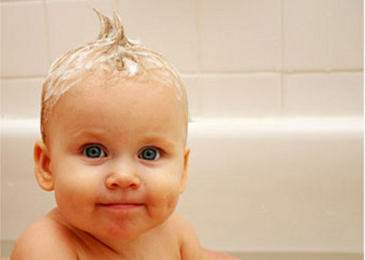 For children, just use castille soaps, using one part castille soap and one part water. Don't use peppermint or tea tree formulas on babies (too rough on sensitive skin). I agree, California Baby Shampoo and Body Wash is the best since they are organic, don't leave a sticky film on the skin (why I hated Dr. Bronners) and are reasonably priced considering how expensive other organic products are. Sodium Coco Sulfate, Coco Glucoside, Sodium PCA, Sodium Chlorid, Sodium Lactate, Sodium Cocoyl Glutamate????????????????????????? ?Are these ingredients ok or dangerous? What a great idea. I never thought to use goggles to keep the soap & water out of my boys eyes. It's amazing the things we put into soaps and lotions just to make us feel better. I try to use all natural products as much as I can. It not only helps me but it also helps the environment. My Son is 9 months old and I still do not use soap or shampoo. Plain old water works perfectly. is essential to ensuring that you know exactly what is being put into the products you're using. I would recommend using Dr. Bronners liquid castille soap base, everything in this product is clearly indicated on the label. If you would like to scent their soap use drops of pure and natural lavender or chamomile. We usually use California Baby shampoo, sunblock and other products. Too expensive, but they seem to be safe and no tears!